Transform your picnic tableware into something special with our personalised party plates. Perfect for picnics, camping trips or a kids party, plates customised with your photos, text or design are a fun way to serve up tasty food. Made from shatterproof plastic for ultimate hygiene and safety. Design your own plate today and get the party started. Give your party tableware a makeover with our plastic party plates. Made from shatterproof plastic, these are the ideal kid's photo party plates but with more health and safety benefits than melamine. Our shatterproof plates won’t break and are super easy to clean, so you can safely let everybody share and have fun. With a 19 cm diameter, they are perfect for serving classic party snacks or using as picnic plates. I ordered personalised plastic plates as a present for my great nephew on a Saturday, they arrived on the Tuesday - impressively speedy service! I'm really pleased with them, the prints are clear and they were easy to design. I can't comment on their durability as I haven't given them to him yet (I ordered them well in advance in case they took a long time), but they seem strong. I would definitely buy from this company again. Would definitely recommend and will definitely use again! Lovely birthday present for my sister, easy to use (although it would have been better if I could have used one design and said I wanted this on the two plates rather than having to keep reloading the photo, although that could be me not using it properly!). Arrived promptly, my sister is so pleased. What Will My Custom Party Plates Actually Look Like? The hard-wearing plastic we use produces such as a clear, beautiful print, so bold colours will really pop. Not completely flat, these plastic plates for parties are a little deeper to keep your buffet table tidy and make serving foods like crisps easier. Who Would Like Their Own Personalised Party Plates? Brothers and sisters will love their own personalised children's plates for dinner time. Not only will they make it more exciting, but they might put an end to any squabbles over the table! They’re also great for people who make their own food and attend farmer’s markets. Print your logo or product name onto the plastic picnic set and impress customers at your stall. Like many of our products, these personalised party plates come with a quantity discount, so if you’re planning a birthday or would just like to have your own custom-made shatterproof plastic plates, buy more than one set today and save money. 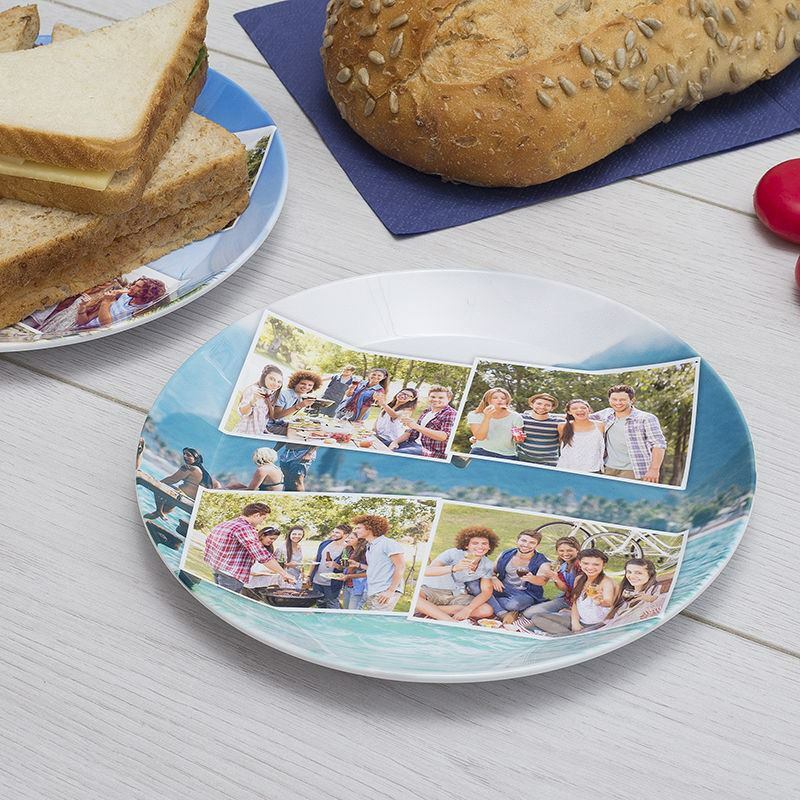 We print your photos or unique design onto the picnic plates using a specialist printing process that guarantees the colour won’t peel or rub away. Each set of plates is lovingly made to order here in London, UK, by our expert technicians. Care: your personalised party plates are microwave safe. We do not recommend washing them on the dishwasher. Instead, use hot, soapy water and clean by hand. They are virtually unbreakable so can withstand falling from kitchen worktops. We do not recommend using a knife and fork with these plates. Use them instead for serving nibbles and finger foods. Please note: Materials and articles in contact with foodstuff – Test method for resistance to microwave heating of ceramic, glass or plastic cookware. Certificate available upon request. For text designs, bear in mind the plate has a slight bowl effect so text will curve when it gets to the rim. If you have a main feature in your photo, position it within the inner circle on our online design tool so it doesn’t distort at the rim. Hosting a themed party? Don’t let it stop at costumes – carry on the fun with personalised party plates to take your event to the next level. Whether you customise your plastic tableware with photos to celebrate a birthday or quirky designs to match your fancy dress, they’ll make the party food more fun to eat. Create your own kids plastic plates for a birthday party. Customised with their favourite football club or cartoon trend would be a hit with not just your child but all their friends too. Family camping trips wouldn’t be right without a campfire, songs and some hotdogs, so why not make it even more special with unique picnic plate set? You can all have your own name and photo printed onto the plate to make sure nobody steals your sausage!